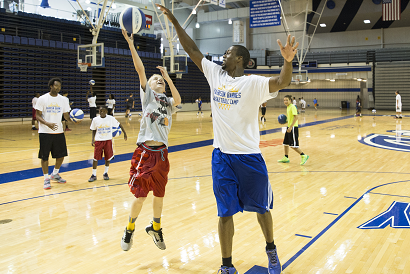 Harrison Barnes Shoots Hoops with DMPS Campers! Hundreds of students attending the DMPS 21st Century Community Learning Center summer program at middle schools around the district got a rare treat Tuesday afternoon – a close encounter with a world champion!Harrison Barnes, fresh from helping the Golden State Warriors win the NBA championship last month, was in town for a basketball camp at the Knapp Center on the campus of Drake University and oh my, he may never have faced a full-court press to match this one. Barnes hails from just up the road in Ames and he honed his basketball skills on courts around central Iowa, including ones in Des Moines high schools, before moving on to one of the nation’s storied college programs at North Carolina. Following his sophomore year there he opted to enter the NBA draft and was selected by Golden State as the #7 pick in 2012. Not all of the campers knew his background and pedigree but enough did that Barnes was swarmed during warmup shoot-arounds. He looked no different than most of the shooters – except that he’s 6’8” and didn’t wear a name tag. He was the one everybody was asking to pose for selfies and sign autographs. On the back his signature scribbled in black Sharpie. Haylee’s transitioning from Windsor Elementary to Merrill Middle School. This summer she’s attending the 21CCLC summer center at Callanan. She knew who she was asking for his autograph. “I’ve been playing basketball for four years,” she said, as if to prove her point. Haylee’s lanky and energetic. She looks to have the makings of a good post player. The cohort from Meredith, almost 50 strong, got to pose for a group photo with the homecoming Warrior. Jocelyn Appenzeller wore a cast on one arm. She broke three fingers on her right, dominant hand last week and was working on dribbling with her left hand. She’ll be a better player for it someday. Tyler Rickets insisted he sank two baskets with Barnes trying to defend him. Isiah Wade brought along his own “vintage” ball in hopes of getting it notarized by the big name on campus. Dakota Davis wondered why Lebron was back in Cleveland, the heck with Harrison Barnes. Barnes’ appearance at the camp was by arrangement between event sponsor Hy-Vee and the Boys & Girls Clubs of Central Iowa. BGCCI extended the invitation to the nine 21CCLC summer sites and the acceptance rate was almost unanimous. Eventually the camp settled into the drudgery of drills and calisthenics, the sort of stuff the headliner’s dreams were made of. It paid off. And Tuesday it paid forward. Des Moines Public Schools is pleased to announce we will once again offer summer programming at eight middle schools through our 21st Century Community Learning Centers- June 8 through July 17. McCombs and Hiatt Students must register online for 21CCLC and also complete the Boys and Girls Club registration (which will be emailed upon registering for 21CCLC, or can also be picked up at the BGC location, or printed from the link HERE) and mailed, faxed or presented to BGC at the club site. The program remains FREE for students attending the program, however the additional registration form is required. Registration is limited at each site so sign up early! If your student requires transportation, please indicate that request and choose a bus stop from the locations provided. Seats are limited and will fill up quickly. Registration for this program is ONLINE ONLY. Please click the link HERE for online registration. You may also apply online by visiting the DMPS website, going to the 21CCLC tab and clicking the Apply Now! link. Since June 9, hundreds of DMPS students have been on a world tour without ever leaving the district thanks to a new summer program that’s made believers out of the pleasantly surprised student-tourists. Ambassadors from cultures including China, Japan, Bosnia, India, Russia, Brazil, Mexico, the Philippines, Kenya, and Ireland shared their cultural traditions at middle school sites throughout the district. On Friday busloads came from all corners for a culminating event at Hoyt MS that marked the end of a journey co-sponsored by the DMPS 21st Century Community Learning Centers and CultureALL, a Des Moines based-non-profit organization that puts the whole world into Iowans’ hands. After a smorgasbord of morning workshops that served up Irish jigs, West African drums, Russian dolls, American folksong, Japanese tea, Chinese calligraphy, Filipino tinikling (yeah, that’s what it’s called and that’s how you spell it so get that red line out from under it!) and lots more in classrooms where the usual fare is a nutritious but bland diet of science, math and English, everybody headed to the auditorium for a closing assembly. In the hallway someone asked if anybody was having a great summer and wanted to talk about it. He was immediately swarmed. One bunch consisting of Maddie, Brandy, Raina, Sophia and Emilie was especially eager to share. Each of them admitted that they had no interest in what their parents had planned for them this summer. They thought they’d been sentenced to six weeks of, yuck, summer school – gross. Until they arrived for the first day. Yes, the word awesome gets more play nowadays than it should. But when it’s used as exuberantly as these Goodrell girls kept using it, it sounds like just the right one. The quintet of pals, not all of whom even knew each other before this summer, was unanimously happy to give parents their props for making them take part. When she walked by they singled out Zeljka Krvavica, one of the CultureALL ambassadors and a native of Sarajevo, Bosnia and Herzegovina who fled her war-torn homeland in 1993, for giving them a taste of Bosnian coffee and pancakes. In return she, like all of her counterpart ambassadors from across the globe, told the assembled kids in the auditorium that she’d thoroughly enjoyed spending the summer with them. Really, it was hard to tell who had more fun, the tourists or their guides. According to 21CCLC District Grant Coordinator Heidi Brown, this was year one of a five-year grant that funded expansion of the 21CCLC programming from the elementary to the middle school level here. “It’s really gone well and it’s kind of sad to see it ending today,” she said. Even if they had no choice this first time around. But Maddie, Brandy, Raina, Sophia and Emilie will be back next summer. If word of mouth still counts for anything in middle school circles, and it does, don’t be surprised if there are more where they came from. Thanks to a 21st Century Community Learning Centers grant, Des Moines Public Schools is pleased to announce summer programming available at eight middle schools beginning June 9 and running through July 18. DMPS is preparing to serve 1,000 incoming students in grades 6-8 with this grant in collaboration with a generous gift from the United Way of Central Iowa. This is a program for all DMPS Middle School students including ELL students with English proficiency. It does not replace ELL summer school for newcomers in the district, and a separate registration will be available for that program. McCombs and Hiatt students must sign up for their programming through the Boys and Girls Club at their locations. This grant, along with generous contributions from United Way of Central Iowa, will serve over 1000 students each summer in arts, culture, STEM, intramural sports and service learning programs. Administrators and staff at DMPS will continue to build and create innovative, fun and academically-sound out-of-school time programs for our youth. The 21st CCLC summer program promises to be just that. 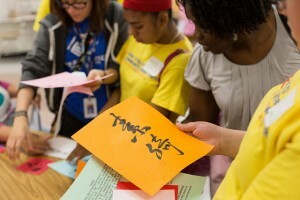 Community and district partners such as AmeriCorps, United Way, CultureAll and Community!Youth Concepts and are working with program coordinators, teachers, and coaches at each school building to offer a summer experience for our students about which we can all be excited. From global cooking to martial arts, technology, robotics, sports, and everything in between. Programs will be run by community partners and teachers/coaches from each school building, which means this is a terrific way for new 6th graders to make connections and our 7th and 8th graders to strengthen bonds before the school year even begins. Hillis Elementary kicked off their new 21st Century Community Learning Centers programming with high note hitting summer fun! Soccer camps and musical theater along with intensive reading and math tutoring rounded out a perfect summer at Hillis.